​Described as “a visionary thinker with a rare intellect,” Sinek teaches leaders and organizations how to inspire people. With a bold goal to help build a world in which the vast majority of people go home everyday feeling fulfilled by their work, Sinek is leading a movement to inspire people to do the things that inspire them. Simon has four more books pending, including Find Your Why: A Practical Guide to Discovering Purpose for You and Your Team, coming out late 2017. A trained ethnographer, Sinek is fascinated by the leaders and companies that make the greatest impact in their organizations and in the world, those with the capacity to inspire, he has discovered some remarkable patterns about how they think, act and communicate and the environments in which people operate at their natural best. He has devoted his life to sharing his thinking in order to help other leaders and organizations inspire action. Simon is also best known for popularizing the concept of Why in his first Ted Talk in 2009. 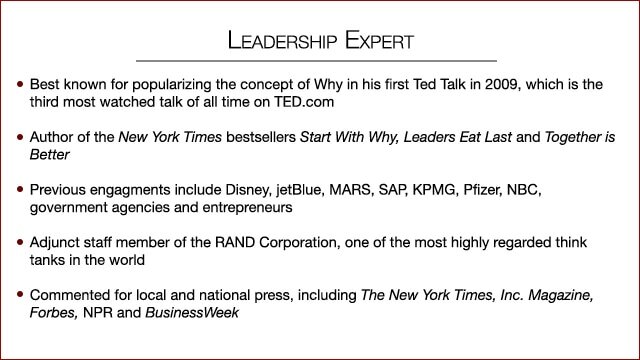 It has since risen to the third most watched talk of all time on TED.com, gathering 27+ million views and is subtitled in 43 languages. Sinek’s unconventional and innovative views on business and leadership have attracted international attention and have earned him invitations to meet with an array of leaders and organizations, including: Disney, jetBlue, MARS, SAP, KPMG, Pfizer, NBC, government agencies and entrepreneurs. Sinek has also had the honor of sharing his ideas at the United Nations, the United States Congress and with the senior leadership of the United States Air Force, Marine Corps, Army and Navy, as well as Special Forces Agencies. Sinek shares his optimism with all who will listen. He speaks around the globe and has commented for local and national press, including: The New York Times, Inc. Magazine, Forbes, NPR, and BusinessWeek. Sinek is active on social media and writes his own blog, simonsinek.com. Sinek is an adjunct staff member of the RAND Corporation, one of the most highly regarded think tanks in the world. He is active in the arts and not-for-profit world, including charity: water, an organization devoted to helping bring clean water to the over 700 million people around the world. He also serves on the board of the Tami Stronach Dance Company and lives in New York. New York Times best-selling author Simon Sinek is an unshakable optimist and he wants to share that optimism. With this beautifully illustrated book of axioms he inspires readers to seek out a brighter future - and build it together -- Simon has inspired hundreds of thousands of readers with his two classic bestsellers, Start With Why and Leaders Eat Last and millions of people with his TED talks. The mission of all his work, from the biggest speech to the simplest tweet, is to build a world in which people wake up every day inspired to go to work, feel safe while there, then return home feeling fulfilled at the end of the day. Now, in this delightfully illustrated book of quotes and aphorisms, Sinek amplifies that vision with new ideas that will inspire readers to overcome obstacles and become the leaders they wish they had. The book is organized around the challenges we all face in the modern world of work, whether we're just out of college or trying to lead a giant company. From confronting doubts, to building a team, to recovering from failure, Sinek helps us see things in a fresh and inspiring way. Consider just a few of his insights.... "A team is not a group of people that work together. A team is a group of people that trust each other." "Fight against something and we focus on the thing we hate. Fight for something and we focus on the thing we love." "We'd achieve more if we chased the dream instead of the competition. "Readers will turn time and again to the aphorisms in Together is Better, and share it with friends, family, and colleagues. It can help anyone get out of the rut most us pretend is the fast track. Why do only a few people get to say "I love my job"? It seems unfair that finding fulfillment at work is like winning the lottery; that only a few lucky ones get to feel valued by their organizations, to feel like they belong. Imagine a world where almost everyone wakes up inspired to go to work, feels trusted and valued during the day, then returns home feeling fulfilled at the end of each day. This is not a crazy, idealized notion. Today, in many successful organizations, great leaders are creating environments in which people naturally work together to do remarkable things. When the conditions in our organizations are right, we naturally trust each other and cooperate. But when leaders neglect the environment in which their people must work, politics, silos, cynicism and self-interest prevail; all things that make it even more difficult for us to work together. The best leaders know how to build those conditions and the best organizations are the ones in which the people work together to confront danger and seize opportunities. Simon will explain what it takes to create an environment in which people work as they were designed - together. It is under these conditions we are at our natural best.